How to unlock my Bmobile phone with doctorSIM? Submit your unlocking request by filling in a short online form with information on your cell phone. Within a guaranteed timeframe, we'll send you simple instructions to your e-mail explaining how to insert the unlock code and complete the process. 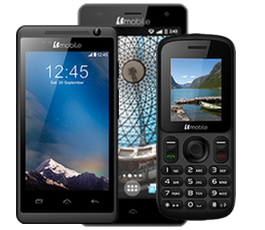 Once the code has been entered successfully, you'll be able to use your Bmobile on any compatible GSM network in the world. Are you sure it is 100% legal to unlock a cell phone? It is totally legal to use a third-party unlocking company to remove the network lock on a cell phone. doctorSIM's unlocking services using the device's unique IMEI number are recommended by Bmobile and the network carriers themselves as they will neither void the warranty nor damage the phone in any way. How do I get the unlock code for my Bmobile through doctorSIM? Click on the green 'Unlock your phone' button above to access a short online form. Complete the form with the information we need on your Bmobile. Read the descriptions of the available unlocking services carefully and perform any necessary checks before making your selection. Finally, choose your preferred payment method to submit your order. We will then send you via email the unlock code and instructions on how to insert it into your Bmobile. Will I receive my unlock code instantly? Although we pride ourselves on being the quickest unlocking company on the Internet, we do not generate the unlock codes ourselves. As an intermediary, we rely on external providers and other industry players to obtain the codes from the networks' databases. Usually, the entire process is very quick but can occasionally take several business days. The exact timeframe will be displayed on the screen once you've filled in the online request form. How much does it cost to unlock a Bmobile cell phone? The price of an unlock code for any particular cell phone depends on a number of factors. The exact price will be displayed on the screen when you select the network carrier the Bmobile was bought from and the appropriate unlocking service if more than one is available. Will my Bmobile ever lock again in the future? doctorSIM's unlocking method via IMEI is permanent. Your Bmobile will never re-lock even if you restore it to factory settings. In the extremely rare case that the cell phone prompts for the unlock code again, simply retype it as the code will never expire. Can I unlock a Bmobile that is under contract? You can still unlock your Bmobile even if you are still paying it off. However, keep in mind that you will have to pay your monthly bills until the contract expires. Fortunately, you'll be able to use your phone on any other compatible network carrier in the world without any problems. Are there any hidden costs or is the price displayed final? Due to some third-party unlocking websites charging a non-refundable processing fee and asking for more money after payment, many people are unsure how much it really costs to network unlock their phone. At doctorSIM you will have no doubt what the final price is to unlock your phone as we only charge you the amount displayed at checkout. There will certainly be NO hidden fees after you've paid. Over 10 years experience network unlocking cell phones. Unlocking method officially recommended by Bmobile. Continue to use your Bmobile while we unlock it. Trustworthy and PCI DSS compliant. Multiple 100% secure payment methods available. Customer support specializing in phone unlocking.